Mobile Device Management — Call Andy! Soon after the release of the original iPad in 2010, Steve Jobs described these new devices as heralding the beginning of the “post-PC” era. Since then, the popularity of all iOS devices – iPad, iPhone & iPod Touch – has exploded. This new technology frontier has opened up new ways of accessing our data, new forms of collaboration and creativity, and new ways of doing business. Along with these changes there are new challenges, especially for IT. When businesses and families start to use multiple devices, keeping those devices in sync, protecting the data, and controlling appropriate access becomes more complex. In broad terms, this new landscape is referred to as Mobile Device Management or MDM. We have received our Mobile Device Mobility Technical Competency (MTC) from Apple. The Mobility Technical Competency is designed to certify that consultants have the necessary knowledge of the Apple mobile platform so they can make valuable and accurate recommendations to their clients who are integrating mobile devices into SMB and enterprise environments. What can MDM do for you? Mobile Device Management takes many forms, with a broad array of solutions available to address deployments ranging from a handful to thousands of devices. Some solutions focus on protecting digital assets (such as contacts, email and documents), ensuring that data in the field is safe and only accessed by authorized users. Others concentrate on controlling access to corporate resources, ensuring that only approved devices are able to connect to the business’ network and servers. Large deployments often involve installing custom apps for use within the enterprise, or ensuring a standard suite of apps is installed and up to date. Most MDM solutions involve some combination of the above examples, each one a unique solution for that business need. One of the most incredible features of mobile device management is that once a device is “enrolled” in the MDM solution, all of the above features can be handled remotely, over the wireless network. Devices can receive configurations, app updates, and user preferences over the air, as long as they are connected to a cellular or WiFi network. The Jenkins are a fairly typical modern family: Bill, Cindy and their three tech-savvy kids: Kathy, 16, Matt, 13 and Bobby, 10. The parents and the two oldest kids each have iPhones. Bill has an iPad he uses for work. Bobby has an iPod Touch. And the family shares another iPad at home for fun, games and general web browsing. Bill and Cindy take advantage of MDM to help keep their children safe online, and to protect everyone’s data in case of loss (Kathy lost her previous iPhone while on vacation last summer and as it didn’t have a passcode, she was pretty freaked that someone could look at everything on her phone). They restrict explicit content on the kids iOS devices and the family iPad. The boys are also restricted from making in-app purchases, requiring them to get permission before downloading more levels of their favorite games. Managing the family emails is also easier with MDM. When somebody forgets their email password, a new profile is pushed to their device with the updated configuration. If one of the kids loses their device again, the MDM solution can remotely wipe it, and then be used to quickly configure a new one to minimize downtime. Having MDM gives Bill and Cindy peace of mind that their kids are being safer with their devices, and enables them to centrally manage the configuration of all their devices. OnDemand Tutors (ODT) is a private tutoring business which provides licensed teachers to a variety of students. ODT has a team of 35 teachers working outside of the office, visiting homes and schools throughout the state. Each teacher is issued an iPad to use as an instructional tool as well as enabling them to stay connected to the head office. Initial enrollment in the MDM solution to facilitate future updatesPre-configured email & shared calendar account informationVPN configuration to enable the teachers to securely access the central database at the head office. This database allows the teachers to enter their time sheets, travel and expense logs and submit reports and grades for their studentsA standard set of restrictions to prevent unauthorized use of the iPads and to disable explicit contentA custom catalog of all the pre-approved, volume-licensed educational apps that are available to the teachers. Once a teacher has her iPad, she simply needs to enter her user name and password the first time she uses it. Her email and calendar is available right away. Depending upon the age of the students she teaches, and the teacher’s area of expertise, she’ll select a variety of apps that she can use with her students. She doesn’t need an Apple ID or a credit card to download and install these apps – they’re all available to her through ODT’s volume purchase program. If a teacher ever loses or has their iPad stolen, the MDM solution can quickly attempt to locate it, if possible. If it’s not possible to recover the iPad, a remote wipe command is issued, ensuring that no private data is compromised. Upon returning to the head office, a new, fully configured iPad is ready for the teacher, minimizing downtime. Greg Thorne is a senior technician in the IT department of Cambridge Square Research (CSR), a large pharmaceutical company with over 2500 employees. Greg has been tasked with managing the deployment of iPads to key executives at CSR. Recently, his boss came to him looking to find a solution for a related problem the IT department has discovered. It seems that many of CSR’s sales staff and senior executives have been using their own iPads and iPhones for work related projects and have started asking for access to the corporate Wifi, email, servers and other resources. Greg needs to find a viable solution for this “bring your own device” (BYOD) situation, as well as continue to manage the deployment of CSR-owned iPads. Fortunately for Greg, his MDM solution can easily handle both types of users. For the company owned devices, Greg’s MDM solution follows the familiar pattern we’ve seen before: Enroll the devices and push a standard configuration along with an approved suite of apps. Greg deploys the devices to the users and continues to manage it over the air. To address the BYOD users, Greg offers a “carrot & stick” approach to them: He’ll grant access to the corporate IT resources (wifi, email, VPN, etc.) as long as the users agree to abide by the corporate usage policies Greg and his boss defined. These policies are then reflected in how the device is managed using MDM. For example, the usage policy might state that the device must be protected with a strong, complex passcode lock; that backups will be encrypted using a password; and that the device will be remotely wiped if it is lost or stolen. Even with the policy, users can still continue to use their device for personal activities, installing games or entertainment apps, storing their personal photos and email, etc. Ostensively, this policy is in place to protect the corporate data and trade secrets. In fact, these policies work for the end user, encouraging best practices while protecting them and their devices. Of course, there are many possible scenarios where an MDM solution can address the needs of both the users and the IT team. 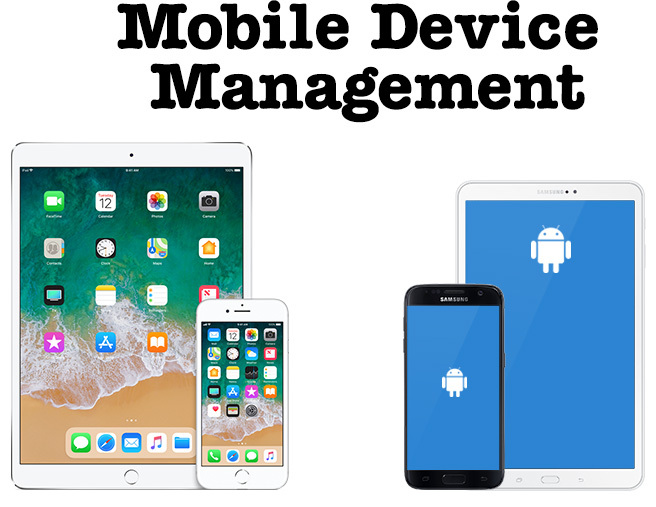 Mobile device management enhances your iPad or iPhone experience by providing security, consistency and centralized management of devices. Whether you’re part of a busy family, running your small business or part of a larger organization, a well thought out mobile device management solution will bring numerous benefits. Contact Call Andy! today to find out how we can build an MDM solution just for you. Please contact us if you’d like further info on any of these services.